From 2008 through to 2013, Sabre Lake was the centre of a number of campaigns that I ran – using B/X D&D, Advanced Labyrinth Lord, and D&D3e. 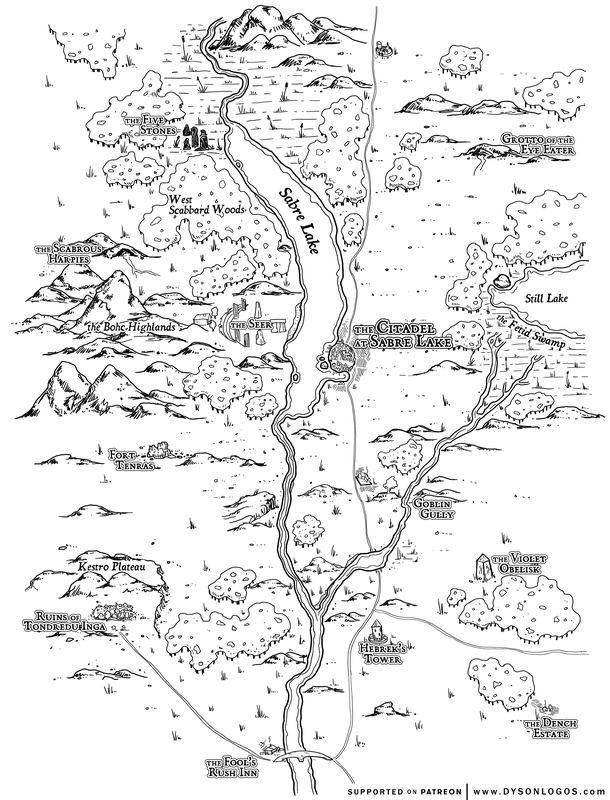 Each campaign focused on different elements of the region – although two of them shared the same intro arc starting with Goblin Gully and then dealing with the horrible thing that was inadvertently released while exploring that site. 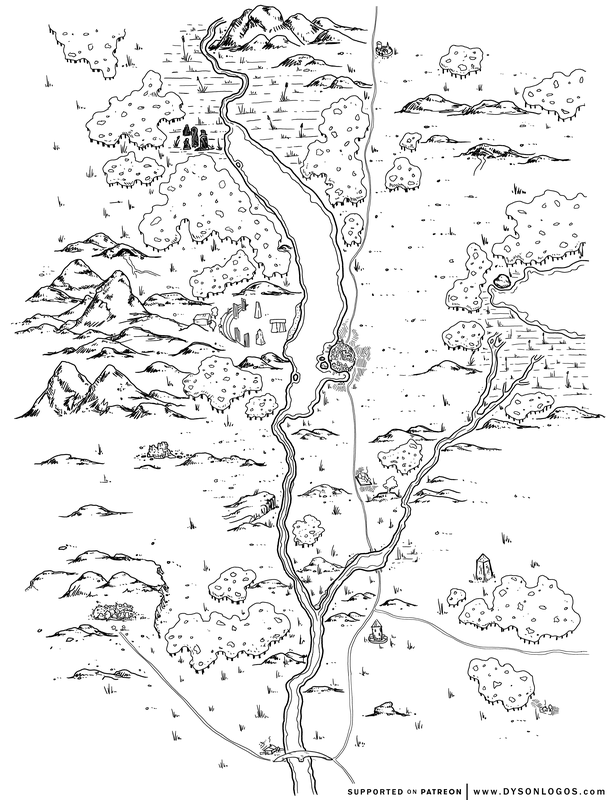 The namesake city of this map is a cheap crib of Sanctuary from the Thieves’ World novels – down to it being on a contested border and fairly recently having changed hands from independent to the Satrapy and then to the Allied Empires. It is the last northern city in the civilized lands. Beyond Sabre Lake there are other cities but they are weeks of travel away and remain independent of the various political factions that rule this portion of the land. The people of Sabre Lake do their best to continue going on as if things hadn’t changed, but the lawless ways of an independent border town don’t mesh that well with the views and laws of the new management. And thus there is strife and friction between the various cults, the Imperial garrisons, the puppet government, and the few remaining citizens with money and clout from the old regime. Throw in the classic feeling of Thieves World to make it a wonderfully crapsack city that you would only love if you were stuck here. The only element that recurs in every campaign I’ve run here is the Seer. 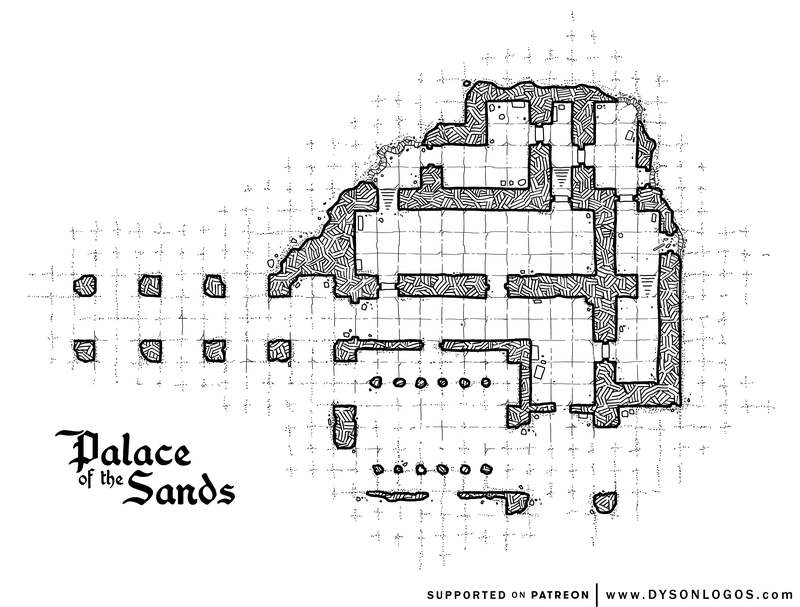 I’ve even had two other campaigns come to Sabre lake over the years to find the Seer of Sabre Lake. To visit the seer, one first visits her shrine in the Citadel, where her acolytes will fill you in on what is needed for you to be granted an audience. Generally it involves renting a nice boat (often from a friend or family member of one of the acolytes), getting it loaded up with expensive or weird things that are useless to you (a samite sail, really? let me guess, your sister weaves samite?) (thirty four feathers from seventeen different swans? ), and sailing across the lake to visit. Those who do not complete the tasks assigned find only a rocky shore and a shallow stony valley. Guests however will find a stony trail at the shore that leads to a much larger valley surrounded by ancient marble ruins. Sometimes there is a test at this point (beat the Seer’s mighty centaur champion at chess!). And then the Seer grants you the assistance of her knowledge and visions. Or just tells you useless riddles. A set of small stony islands jut out of the waters near the the northern reach of Alders Bay. They contain a number of small ruins, likely linked to the ruins of the castles and forts that have slowly been overwhelmed by the encroaching swamps on the northwest shore of the bay. Difficult to land on, the islands are surrounded by ship-killing shoals and much of the land is atop tall red cliffs. Most make landfall on the sandy extension that nearly forms an isthmus between the two eastern islands – although the Oni pirate Vurd Skullbow has been known to bring his vessel in through the southern access and anchor it between the three islands. Each island has its own point of interest. 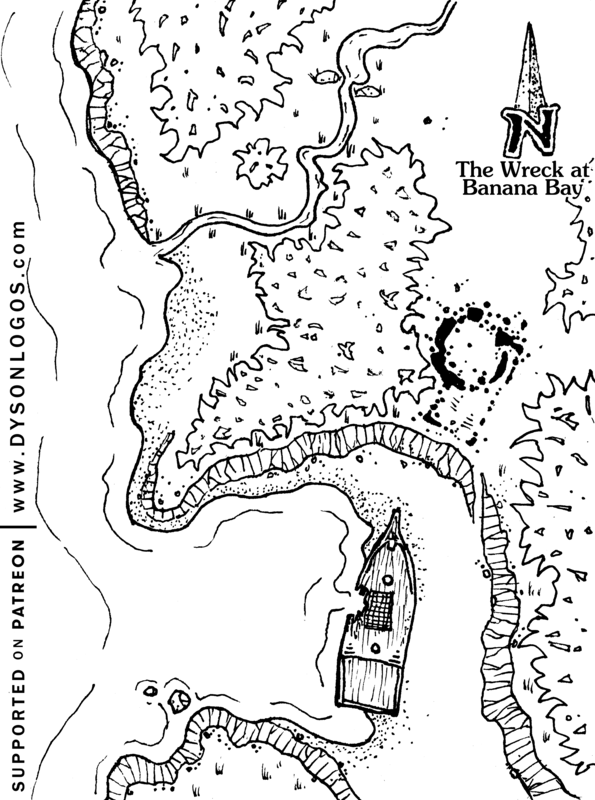 The large island has a ruined watchtower on its peak, but also has a cave system beneath it that was expanded at some point, likely by the builders of the tower. 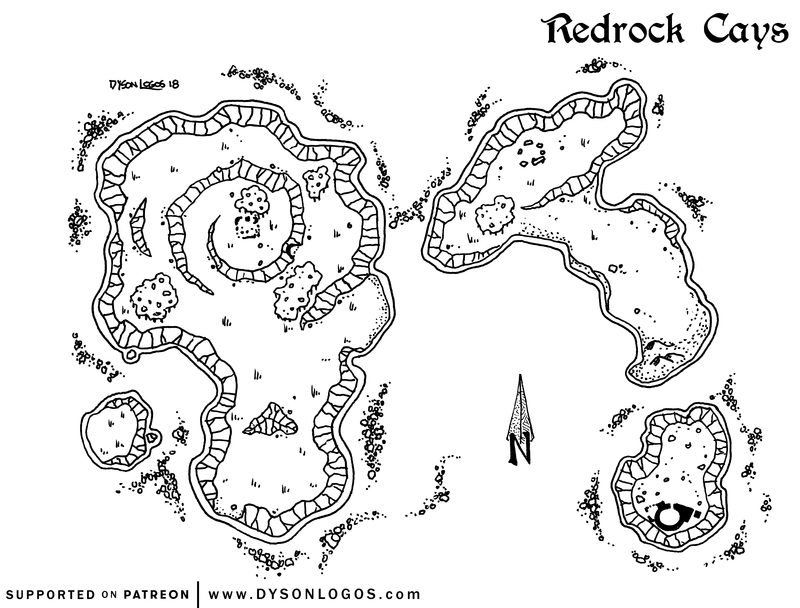 Those caves are used by Vurd to stash treasure and hostages on occasion. The northeastern island bears the marks of many landfalls and small campfires. The long beach is littered with detritus – much of it charred firewood and empty bottles and casks. On the rise of the island is a set of fairly recent standing stones – no more than a hundred or so years old – the stones all appear to have been scavenged from the other ruins on the islands. The small island to the southeast still sports a standing watchtower, although the wooden roof has long rotted away. The island however offers no means to get to it – the top of the island is a solid fifty feet above the waters below, with treacherous cliffs on all sides. 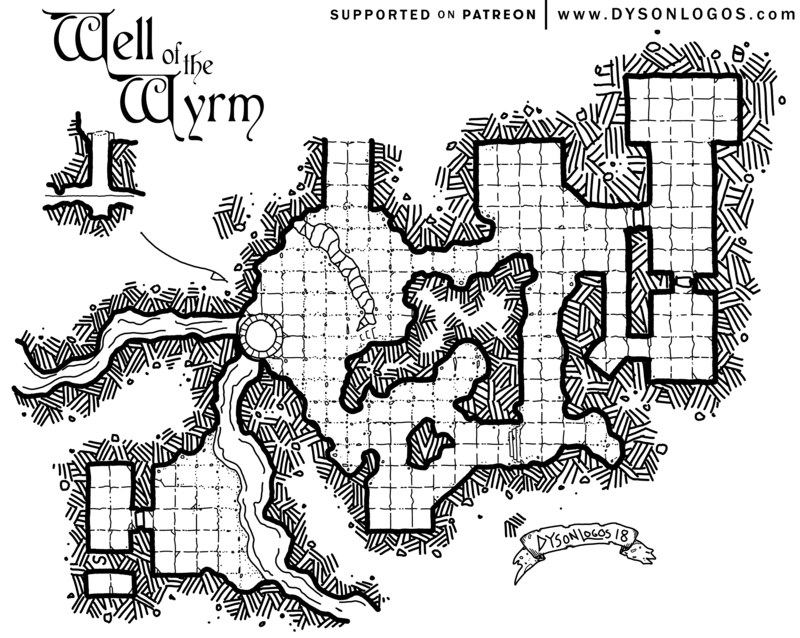 While a number of the old shaft tombs of the Etturan Dynasty have been found and explored, there is one that remains a well-kept secret amongst sages, masters of dark arts, and the few adventurers who have been there. Possibly the original shaft tomb of the dynasty, or perhaps a strange discovery that became the inspiration for the ones to come – the Bottomless Tombs seem to have earned their name. The central part of these tombs is a 30 foot x 30 foot shaft that seems to go down forever. 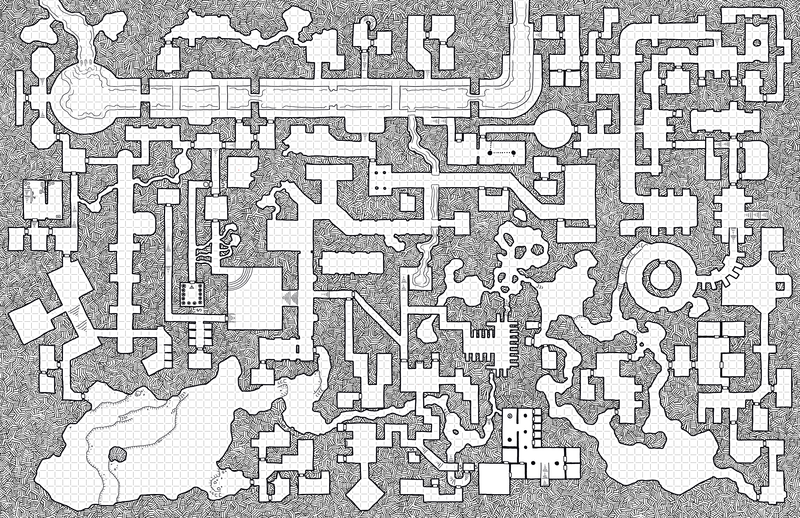 Determining the actual depth has proven to be beyond the abilities of scrying and simple engineering, and areas of both permanent magical darkness as well as areas of anti-magic (as well as a host of hostile inhabitants) make exploring the depths of the shaft an unwelcoming idea. 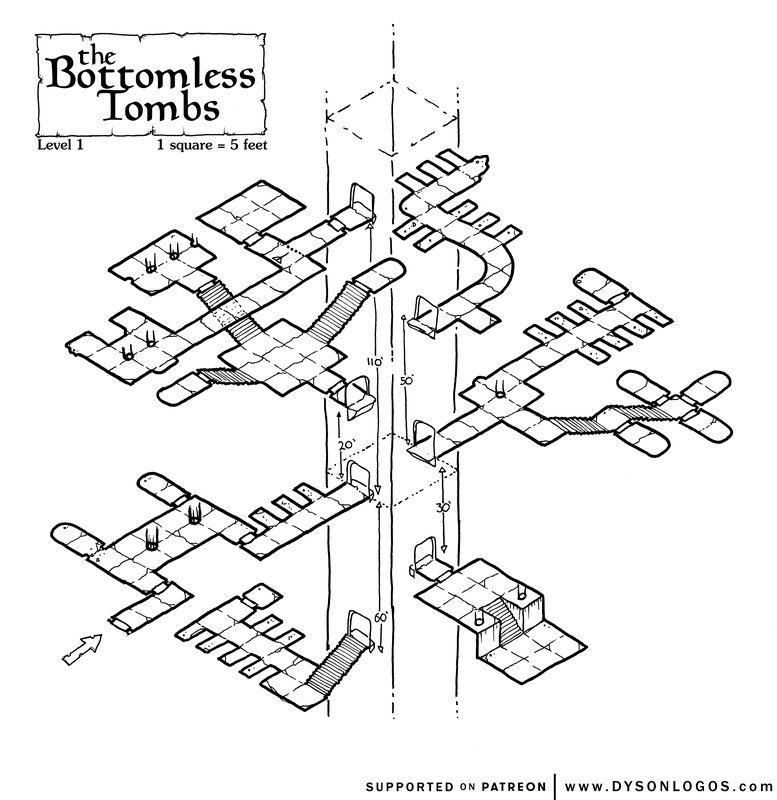 But this map concentrates on the tombs around the upper portion of the shaft. 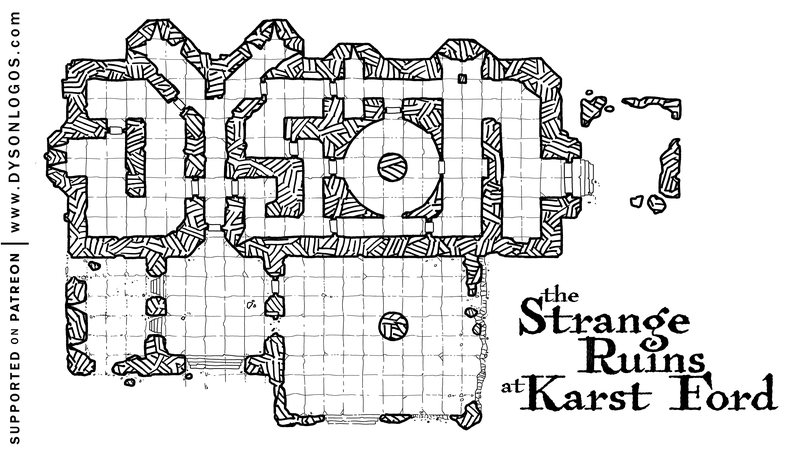 A total of seven tomb structures have been cut into the shaft at this area, including the Vault of Kezamdomnus which is accessed via the basement of the long-ruined Temple of Shol-Gath. 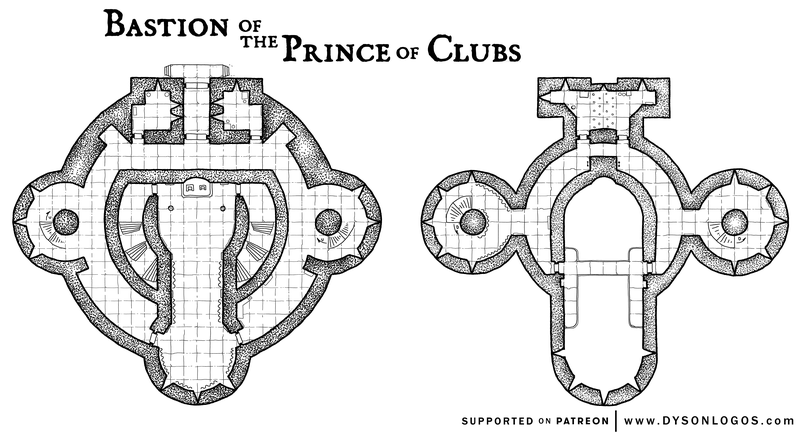 These tombs and crypts are in turn protected by the inherent danger of the central shaft, as well as their own traps, magical guardians, and sometimes even the undead remnants of their inhabitants. Word came back from some fishermen that there was a cog beached at Banana Bay – one of the few decent approaches to Esborough Island. So we loaded up a small expedition to check it out – it is usually pretty hard to get any of the locals to head to Esborough because of all the “haunted” ruins about the place, but their willingness to loot / rescue the ship was enough to motivate them and thus finally gave us the chance to explore the place a bit also. But the boat was in even worse shape when we arrived – the port side burned through roughly midship, with the ruined interior of the ship laid bare to the elements. As the locals started digging through the wreckage, we climbed up the low cliff face and up to the ruined tower that looks down on the bay. Within we found the burned bodies of a half dozen sailors, and the first of the cinder wraiths. They look like smoke with embers floating within them, vaguely humanoid in form. They travel on the wind, they strike with fierce anger and a fiery hatred for the living. MissGladiator’s mother gave me this leather-bound “banana paper” notebook that she picked up in Cuba. I wanted to try it out – but the paper is so coarse that it actually shattered the felt nib on a micron, so I’ll have to try using it exclusively with my gel pens and see how that works. I love the paper thickness (about 3-4 times as thick as 100 pound cardstock), but it is hard to work with. Southwest of Baraloba, the Eagle Hills continue into heavy forests. The closest thing here to Baraloba itself is yet another of the old giant’s watchtowers – although this one is not as decrepit as most of the other ruined towers in the region. A druid and their apprentice maintain the tower and keep a small herd of goats that keep the grass in the hills and vales of the area nicely clipped. A trail leads from the tower into the woods and to a massive tree in the middle of a clearing where the druids perform their rites and occasionally just engage in silent contemplation. A little further to the west another trail leads through the woods to a very large farm / small farming community. 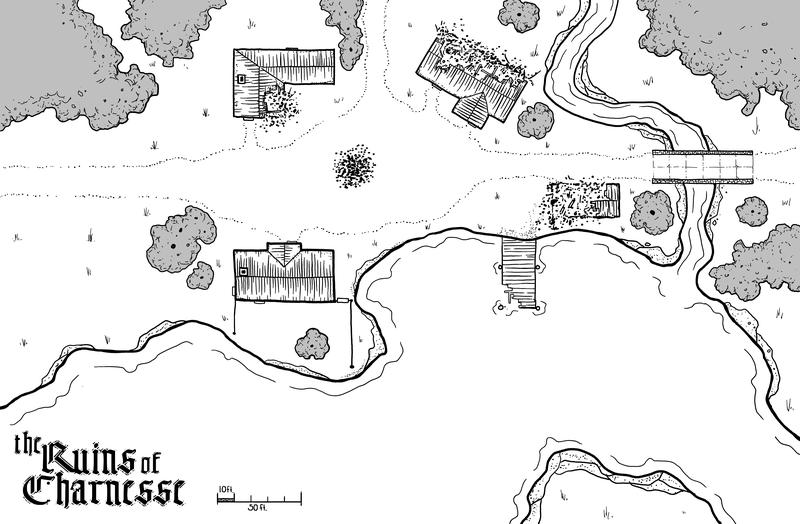 A couple of large multigenerational families run these farms and generally try to be self-sufficient, only walking to Baraloba when they require supplies they cannot find or make on their own or with the help of the druids in the tower. The rest of the hex is unpopulated wilderness – rolling hills and a few jutting chunks of stone, expanses of dark and heavy forest teeming with wildlife, small bubbling brooks, and a lazy river looping gently through the hills. 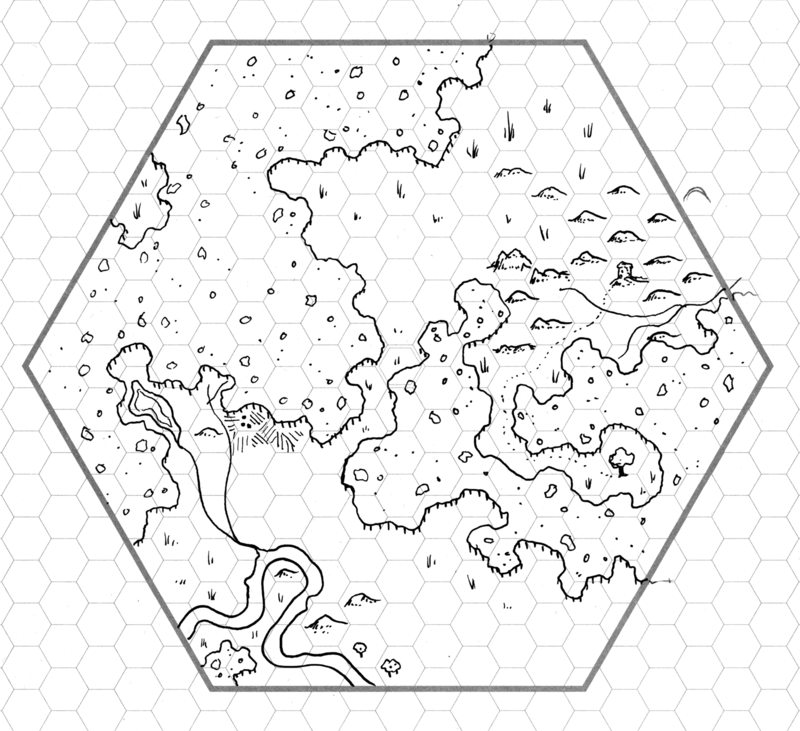 And here we see how the set of seven Baraloba hexmaps fit together. 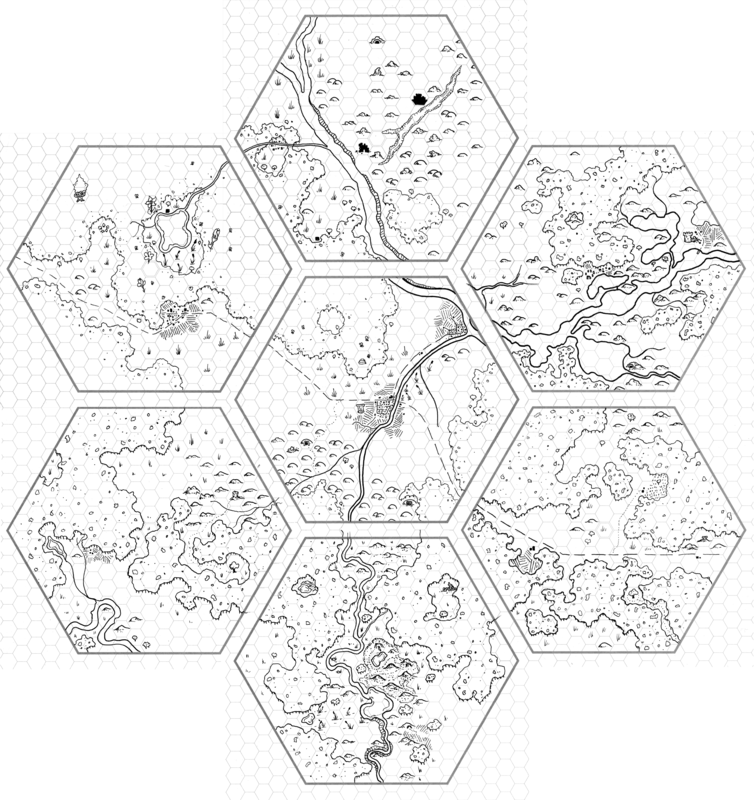 On a normal 6-mile-hex map these would be a village hex in the middle with (clockwise from the top) badlands & ruins hex, hills hex, forest hex, hills hex with mine, forest hex, forest hex. 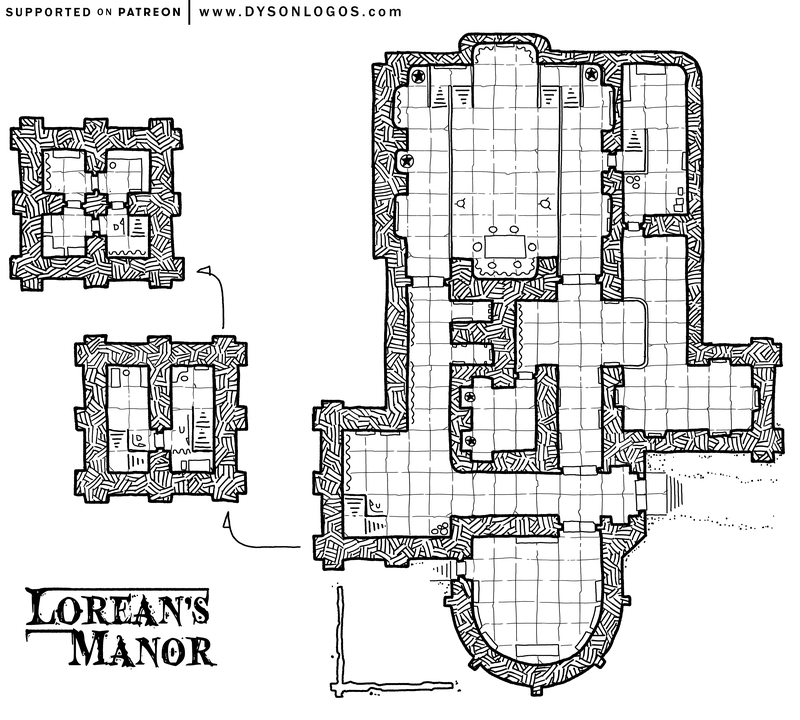 A Fifth Edition adventure for level 3 characters. This Fifth Edition adventure is written by Zzarchov Kowolski (Thulian Echoes, Scenic Dunnsmouth, A Thousand Dead Babies, The Gnomes of Levnec, etc), illustrated by Chris Huth (Ashen Stars, Call of Cthulhu Investigator Handbook, Night’s Black Agents, 13th Age Glorantha, etc), and mapped by Dyson Logos (Waterdeep – Dragon Heist, Circle of Hands, Dyson’s Delves, this whole blog, etc). 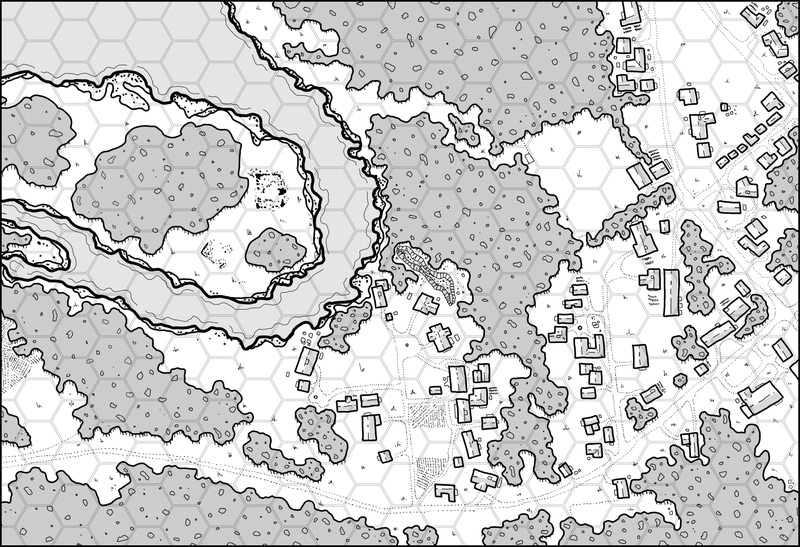 It will work with most campaign settings as long as the adventurers are near (or can be brought near) a large mostly uncharted forest or jungle.